Llandudno Bay is flanked by two steep headlands sticking out into the sea, the Great Orme ɔːm and the Little Orme. As we gazed on the Great Orme, one of my friends asked me the etymology of ‘Orme’. I said I thought it was probably a form of worm. I was aware that in the Gower in south Wales there is a promontory called Worm’s Head, and I had a sort of feeling that orm was the Norse or Danish word for ‘worm’. I was nearly right. But my questioner wasn’t satisfied. How, then, she asked, was this great headland similar to a worm, an earthworm? What I had forgotten was that the English word worm used to mean ‘serpent, snake, dragon’. Orm still has that meaning in Scandinavian languages, though in English this sense had died out by about 1800. It is easy to imagine how seafarers could liken this headland to a dragon or a snake. According to Owen and Morgan, Dictionary of the Place Names of Wales, the Orme at Llandudno is from ON ormr ‘snake’, but Worm’s Head in the Gower is from OE wyrm. 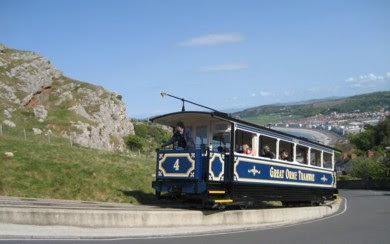 The Welsh name for the Great Orme is Y Gogarth. Fancifully, I wondered if that had any connection with arth ‘bear’ (cognate with Greek ἄρκτος árktos), with an intensifying go- and a hypercorrect initial prevocalic -g- as in gwyneb for wyneb ‘face’. Then it could mean ‘great bear’. But no, apparently the earlier form was gogerdd, meaning merely ‘ledge, terrace’. Very disappointing. Just had a quick glance out of my office window, but I'm afraid the Great Orme is shrouded in mist today so I can't see the dragon. This old meaning of worm reminds me of the Lambton Worm legend from County Durham which, it has been speculated, may have inspired Lewis Carroll's Jabberwocky. Anyhow, to wrench this back to phonetics, the Lambton Worm legend is associated with Penshaw Hill near Sunderland. Just as with nearby Houghton-le-Spring, Penshaw can catch out those without access to a local or a pronunciation dictionary: it's [ˈpɛnʃə]. Re "According to Owen and Morgan, Dictionary of the Place Names of Wales, the Orme at Llandudno is from ON ormr ‘snake’, but Worm’s Head in the Gower is from OE wyrm." Yes, in one sense, but the South Wales coast had more substantial Viking settlements than North Wales. My guess is that Worms Head was originally named by them exactly as they'd named the N Wales promontory and centuries later "Anglicised" at the time of English settlements in the area. "Orm still has that meaning in Scandinavian language"
That's a stretch - in Danish at least. I'm only aware of it being used that way in mythology. Regnar Lodbrog may have died in an "ormegård", but today we'd call it a den of vipers. Tolkien revived this sense of worm, as he did with so many other obsolete words (e.g. mathom, dwimmerlaik) and senses. In The Hobbit, the word appears seven times, only once in the modern sense. For example, in Chapter 2 the villain of the book is introduced with the sentence "There was a most specially greedy, strong, and wicked worm called Smaug." It also is used in the nonce compounds were-worms and wormstench. I daresay there are now many people who recognize the old sense as a result: I first read The Hobbit at age seven, and I have no doubt that I thought nothing peculiar in Tolkien's use of worm, though I would hardly use it myself. In Tolkien's short story "Farmer Giles of Ham", the word is even more common: it appears 15 times in 7000 words, always in the sense 'dragon', and also in the proper names Worming, Wormwardens, and Worminghall, the last being an actual village in Buckinghamshire near Thame. In the real world, the village name is generally taken to contain the proper name Wyrma, but may (and for story purposes, does) contain wyrm directly. William Morris preceded Tolkien in the use of worm 'dragon', but before that you have to go back to Sir Gawain and the Green Knight in the OED's quotations for a literal use. The 1526 Tyndale translation of Acts 28:4 shows it in the sense 'snake', and similarly in Antony and Cleopatra, 1606; Milton and Pope use the Worm metaphorically for the Devil, after the usual interpretation of Genesis 3. Well, in Swedish, anyhow, according to my Svensk-engelska ordboken. I was going to say that it reminded me of Tolkien's works, but you beat me to it. It's delightful to know that "Orme" has such an interesting etymology behind it! And I'm always one for a nice bit of etymology, studying Linguistics as I do. Very nice read if I do say so!